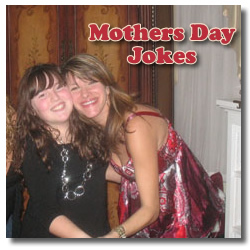 Mothers Day Jokes should be included in your gift, especially if your Mother has a fun and silly side like mine does! A great way to incorporate these jokes into a gift is with homemade Mothers Day cards. If you go to most local store you can find great Mothers Day cards ranging from inspirational to funny. This is great (and convenient) for those of us with time constraints or a lack of creativity. But if you have the time, I think its wonderful to make your own Mothers Day card! To make a funny and unique Mother's Day card, start by doing some research to find the perfect joke for your mother. Depending on how relaxed your mother is you might want to keep it appropriate. I grew up in a great big family and they didn't have many boundaries so appropriate was never something I worried about, but for you it may be different! You certainly don't want to offend your dear mother on this special day. 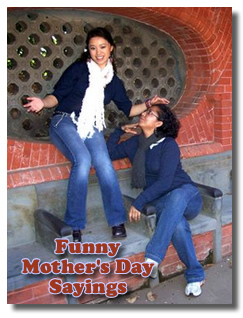 I did a little research and found a site with Jokes about Mothers Day that are both colorful and silly just like my mom. My favorite joke was called "More Things My Mother Taught Me." The joke itself is quite long, but it is basically a list of little one liner scenarios that you mother taught you. What's great about this joke is that it is simple to pick a few lines that you like to incorporate into your homemade Mother's Day card. "Put your sweater on; don't you think I know when you are cold." The best part about this old classic Mother's Day joke is that almost everyone can find a few lines that they can personally relate to! A great way to turn this joke into a homemade card would be to pick one that really speaks to who your mother is. For me it would be the one about stamina. To make it even more personal, you take a picture from your childhood which ties into the joke. For the stamina one it would be fun to put a picture of you as a child surrounded by a mess of food (we all have that picture!) and place it on the front of the card. On the inside include the Mothers Day joke you like best and it's sure to bring a chuckle to your mom. Most importantly, with these mothers day jokes be sure to have a sense of humility and the right spirit, so your mother knows it's all in good fun. You can do this by signing the card with a sincere message from your heart! The best part about jokes is you can be fun and silly while still showing your mother gratitude, and for me and my family there is nothing better then a good joke! ~ Shared by Kate H.